Yes I know, and I know you know. But you’re assuming that everyone has a thorough knowledge of Pokémon, not everyone (including in this forum) does. It’s totally fine! I was super confused because I knew you knew T-tar typing. At least now I know that rock T-Tar is in reference to SD Tar. How do you fare in your group? Are you still one of the stronger players? It depends on whom you ask, but they can’t say that I don’t know what I’m doing. I’m also at Best Friends level with much of my normal Raid Groups, so our damage bonuses kick in nicely. Many of them do have healthier respect for many Pokemon I’ve used, like Mismagius, Giratina and Swampert. Can you do stuff like Ho-oh/TTar duo? Those particular challenges require very specific Pokemon on top of weather conditions and Friend Boosts, so no, I don’t. If you intend to partake in those challenges, I recommend you do what the guides on this site require. 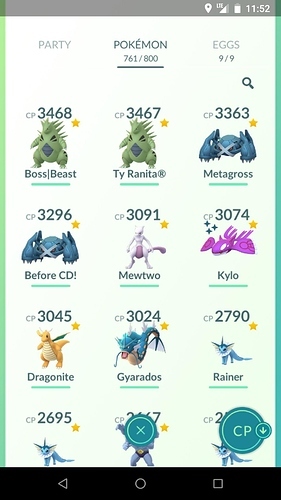 I generally don’t bother doing those challenges because my goal in raids is to attempt to get Rare Candies and TMs for Pokemon I intend to use in the future. It’s not about testing the limits rather than simply obtaining needed tools to make future Pokemon much easier. Not the best, but I’m pretty pleased with what I have. Thanks, I was on vacation for a while. Your shiny Kyogre is cool.